Telephone Directory, published by Thomas-Mayo Company and printed by The Stayton Mail. No publication date is included, but it appears to have been printed about 1915. 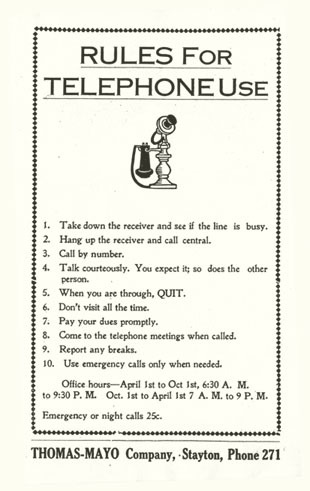 Names are grouped by telephone exchanges -- these were subscriber-based. There is some cross-over in communities. For example, the Scio listing includes folks subscribed to that exchange. However, other people with a Scio post office address were subscribers to the Stayton Exchange, so are included in that section. Be sure and check all the lists for your surnames of interest. A map of the area covered by this telephone directory is included.